It is strange to think that, about six years ago, I used to beg my parents to take me up to Liverpool. I could never in my wildest dreams have imagined that there would be a time where I would only have to take two short train rides and be at Liverpool Lime Street in half a heartbeat. There was a time when I used to lie back on my bed, cheap neon pink earphones plugged into my beaten up black iPod Nano as the beats and rhythms of the Liverpool-born super group, The Beatles, provided an escape from unfinished Maths homework and the other realities life mercilessly throws at a person. I used to picture myself strutting down the pavements of Liverpool, surrounded by an accent that literally was music to my ears, the glorious smell of fatty chips frying as a bassline hummed up the steps and onto the cobbled street from the Cavern Club. Back then, I never realised a person could be a tourist in their own country. When my girlfriend suggested taking a day out of our week together to head up to Liverpool, my excitement made it harder to sleep at night. When the day came, I was up and early before her. Two uneventful train rides later, we were finally under Liverpool Lime Street station. Beatles artwork hit us squarely in the face before we even left the station; it seemed every artist in the local area had trained their brushes to trace the features of the Fab Four’s faces. It was not just artists who had The Beatles on the brain. Every busker, young and old, seemed to be flipping through their back catalogue. I think I heard about five different covers of John Lennon’s ‘Imagine’, and three of ‘Nowhere Man’, before we dived into a café. Up a flight of stairs and we were standing in the fancy, spacious interior of the independent coffee house, Rococo. After ordering, we walked down the lengthy corridor, past smaller, quieter, rooms for customers to lounge in, and found a sofa at the back. Rococo is the perfect place to go to if you are looking for a quiet place to have a small bite to eat and a cup of something warm before heading out. I lay back on a flock patterned sofa (which would not have gone amiss in BBC Sherlock’s apartment), honestly considering staying there all day and consuming their entire stock of scones. Our next stop was the Liverpool World Museum. Stepping inside the hulking structure, I was taken aback by how modern the interior looked. Each floor in the museum related to a different topic – dinosaurs, space, culture, and so on. It was like no other museum I have ever explored. After escaping the infant anthill that was the Liverpool World Museum, we walked down to the bank of the Mersey River and enjoyed an ice-cream just as the storm clouds started rolling in, threatening to burst at the seams and bring an ocean down on our heads. As I sat there, looking out across the gentle waves, I found myself humming Ferry Cross the Mersey – a fitting tune considering where I was sitting. After the ice-cream interlude, we explored the Museum of Liverpool. Of course, there was much made of the rock groups that had grown out of the Liverpool ground, but there were engaging sections that explored the local views on disabilities, gender and sexual equality, as well as the effect the different world wars had had on the city. On our way back to the station, we stopped by the infamous Mathew Street. In the heart of the various restaurants boasting John Lennon had once eaten there, was the Cavern Club. I had written prose about the Club – one of my characters had sat on the cobbled street and smoked a cigarette outside the mouth of the music hub. 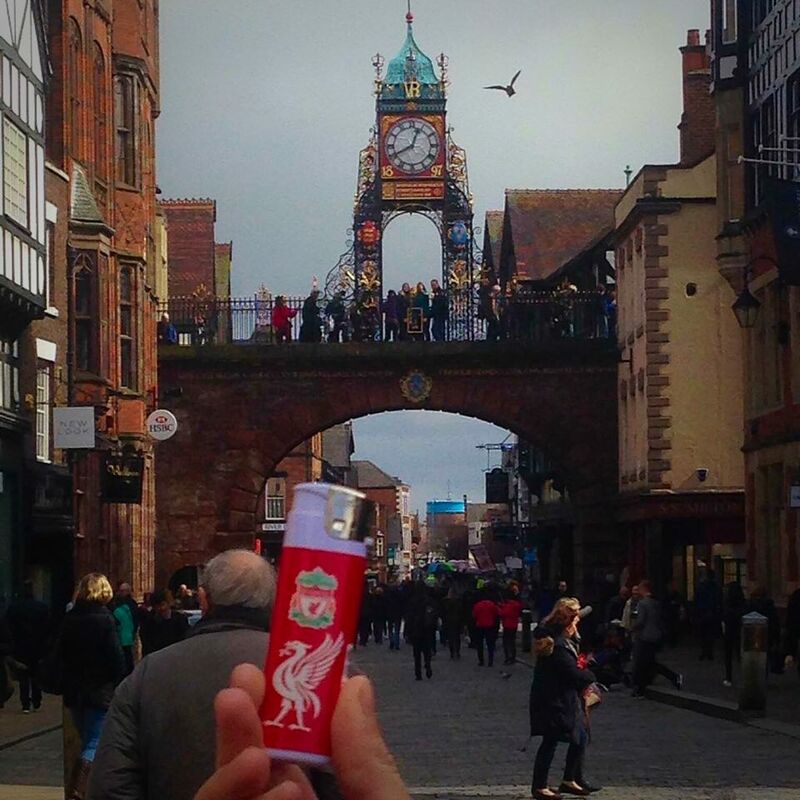 I wanted to take my lighter photo in front of a notable Liverpool location, but as we were short on time, I took it in front of the Chester clock as I was about to leave. I already miss Liverpool, so I am flicking through Liverpool playlists on 8-Tracks, waiting for the day I can come back and walk down the roads less travelled by tourists.